I hope that you’ve had a good week. If you can believe it, we are prepping for yet another typhoon. It’s due to hit us this weekend. So, again, we are busy managing event cancellations and rescheduling, print and web updating and PR pushes to keep our customers informed. Hopefully the storm will be short and sweet and we’ll be back to normal quickly! This week I’d like to explore another aspect of branding that is really important. It’s personal branding; building a visual identity for YOU. Over the past few years, as the economy has behaved similar to the typhoons we often get in my neck of the woods, many professionals have shifted their focus to marketing themselves-a smart move when you are out there competing for your dream job. Many of us have well-rounded skill sets and bring unique talents to our work teams and clients. We want potential employers, joint venture partners and collaborators to see how we stand out from the rest. A great way to do this without building a full-scale website is to create an interactive resume. If you do have a website, linking to it in your resume can drive traffic there. Social media links can be placed too. Building an interactive resume is something that I have recently started offering to my clients and that has garnered great results thus far. It can take on a few different variations. Anything from a few pages, built in Dreamweaver or a simple CMS site. It can even be an interactive PDF file that gets a link on your blog, like MINE. Below is a screen shot of the top of the home page. Keep in mind that building this incorporates all of the elements that I’ve been writing about; determining your purpose, determining your target audience and writing effective copy. Then on to color, typefaces, your logo and graphics. I always start these projects with a thorough consultation and a mockup. These can be photoshop files or live wireframes that can be clicked through. This week’s color tip is actually a palette that is a front-runner in a logo design that I am working on. 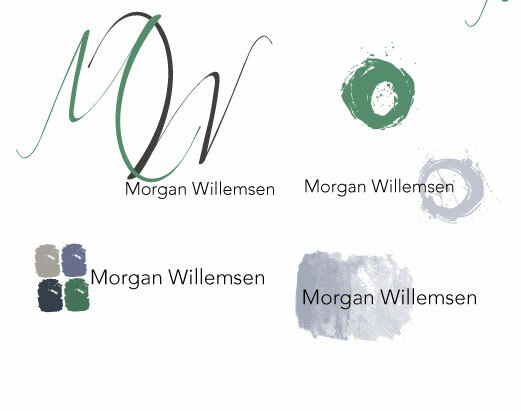 The logo is for the photographer whose work I often feature in my posts, Ms. Morgan Willemsen. Morgan is a brilliant and creative woman who brings passion and creativity to her work. She and I have been working together on the mood board for her logo. Below is another palettes that is in consideration as well as some early colored roughs of the logo.